Knuckleballs are mostly associated with baseball in the United States, but this devilishly unpredictable ball motion also shows up in soccer, cricket, and volleyball. Yet it’s never seen in other sports like squash, basketball, and table tennis. A team of French scientists think they’ve finally figured out why and describe their conclusions in the New Journal of Physics. What makes the knuckleball so damned difficult to hit or catch is its unusually erratic trajectory. It starts out flying straight through the air, but can break quite suddenly in any direction, zigzagging wildly late in its flight. So naturally players and coaches around the world are quite keen for any new insights science has to offer that might give them an edge against the knuckleball. Part of the secret is the spin, or lack thereof. In baseball (and cricket), knuckleballs are the result of pitchers (or bowlers) holding the ball between the knuckles and using just the fingertips to avoid putting a spin on it. New York Mets pitcher R.A. Dickey is famous for his knuckleballs, winning the 2012 National League Cy Young Award for his skill. A spiked volleyball can also exhibit that telltale zigzag motion. In soccer, when a player strikes the ball in such a way as to give it very little spin, the ball will flutter unpredictably from side to side—a specialty of Real Madrid star player Christiano Ronaldo. In Brazil it’s known as pombo sem asa (“dove without wings”). In 2012, scientists at the Ecole Polytechnique in France managed to devise a set of laws predicting how much different ball sizes, moving through a fluid (notably air and water), would “knuckle.” They conducted a series of experiments that included dropping steel, glass, and plastic beads into a tank of water spiked with fluorescent dye, the better to study their trajectories with ultrafast cameras. All the beads zigzagged in the water, regardless of density, and the less dense the beads, the more they knuckled. But their initial findings predicted that we shouldn’t see the knuckeball effect in soccer. So what might be Ronaldo’s secret? The key is something physicists call the drag crisis. “When a sphere is in a flow, there is a critical velocity at which the wake behind the sphere and the drag force acting on the ball sharply decreases,” co-author Caroline Cohen told Inside Science News at the time. That asymmetry in the wake creates a sideways force resulting in the zigzagging motion. So generally speaking, the surrounding air flow is different on opposite sides of the ball, and since the distribution of air pressure is constantly changing, the ball will flutter. That means Ronaldo must kick the soccer ball at just the right velocity (close to the drag crisis threshold) with no spin to produce a knuckleball. And the smoother the sphere—i.e., the fewer seams in the ball—the more you see the knuckle effect. Now Cohen and her Ecole Polytechnique colleagues are back with a new analysis of the knuckleball effect. This time around, the team built their own custom kicking machine to launch balls through the air in a wind tunnel at different speeds, with very little spin. And they found a more universal culprit for the knuckling effect: unsteady lift forces. 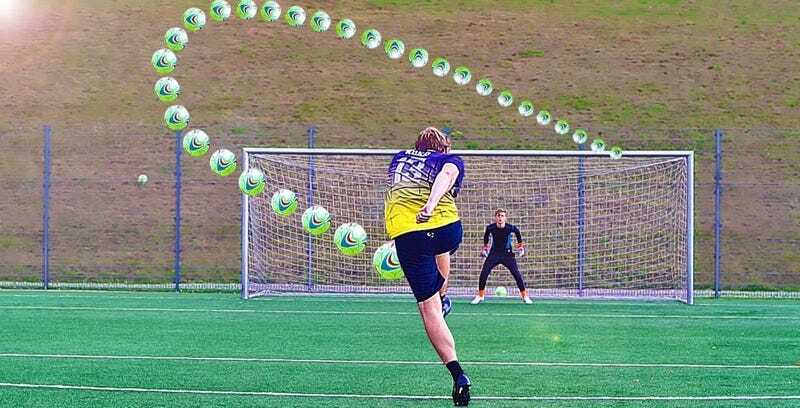 However, “Unsteady lift forces are inherent to balls traveling through the air in every sport, so to complete our work we needed to find out why zigzag shots are associated with just a few games, such as soccer or baseball,” co-author Baptise Darbois Texier said in a statement. Once again, the drag crisis proved critical: there is a sweet spot in terms of velocity that produces larger lift forces and more side-to-side movement. The typical shooting distance for any given sport also matters. “In bocce, for example, a zigzag path should occur over a length of 27 meters, but this distance is much longer than the typical shooting length and so the knuckleball effect will be incomplete,” said Darbois Texier. And that’s why we typically don’t see the knuckling effect in bocce, handball, table tennis, or basketball.